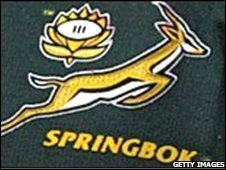 A new emblem is to adorn the rugby jersey worn by South Africa's national team, replacing the Springbok antelope, say rugby officials. South Africa's national flower - the King Protea - will now have pride of place on the left-hand side of the world champions' rugby jersey. The 102-year old Springbok emblem will move to the right-hand side. Critics wanted the Springbok removed completely as it was a painful reminder of the country's apartheid past. "The decision was taken to accommodate the application of the national sports emblem - the King Protea - and to bring SA Rugby in line with other South African sports federations," the South African Rugby Union said in a statement. The timing of the change has not been decided, it added. The change has inspired intense debate, with critics describing the Springbok as a symbol of the Afrikaner community which ruled the country under apartheid. In the days of white supremacy, rugby became the country's pre-eminent sport and black players were not allowed to wear the Springbok jersey. While rugby in the country remains a white-dominated sport, some argue that racial barriers were broken in 1995 when former president Nelson Mandela - wearing a Springbok jersey - lifted the World Cup trophy after South Africa won the tournament for the first time. The 1995 World Cup-winning team contained only non-white player, Chester Williams, and the team which beat England to win the 2007 tournament contained just two - Bryan Habana and JP Pietersen. The Springboks are now coached by their first non-white coach, Peter de Villiers, and the team which hammered England 42-6 on 22 November had six non-white players in the starting XV and another two on the bench.